Religion, like partisan politics, often leads to diametrically opposed opinion, vociferous debate, and unfortunately at times, overt violence. Also like politics, it is generally not a topic for a dinner party should anyone wish to maintain an appetite for dessert. There are 2,100,000,000 Christians, 1,500,000,000 Muslims and billions more in various other faiths. Entering “religion” into an Internet search engine reveals 370 million citations referring to the 4,200 reported distinct faith groups. When membership in all the major religions is added together, it is estimated that 80% of the world’s adult population lives their life within the structure of a known religion. Authors Lionel Tiger and Michael McGuire attempt in this rewrite of a text first published in 2010 to give a scientific and objective assessment of what constitutes “religion.” Perhaps even more importantly, their book attempts to unravel the various threads of these religions to elucidate why religion is so prevalent in the world’s cultures and throughout recorded time. The authors’ fundamental hypothesis is that there are several elements common to all religions; specifically belief and hierarchy. Furthermore, socialization and rituals form the cornerstones of a religion and its followers. They postulate that religion is a construct of the human brain and virtually inevitable for human beings. Day-to-day life with its permutations and contradictions creates stress, an anathema to the smooth operation the brain. Religion with its socialization, rituals and beliefs provides brainsoothing, which is craved and important to optimum functioning of human beings. They rightly state that the brain strongly prefers certainty over uncertainty, resolution over open endedness and balance and symmetry over imbalance and asymmetry. Each of these preferred outcomes is provided, at least in part by religion. When the faithful believer participates in rituals, enjoys the socialization of a tightly knit common interest group and shares in mutually held beliefs, his or her brain finds calmness, and pleasure in the broad sense of that term. When a follower lives his life according to the informally held rules of the religion, the belief system often promises paradise after death—an incredibly powerful attraction. 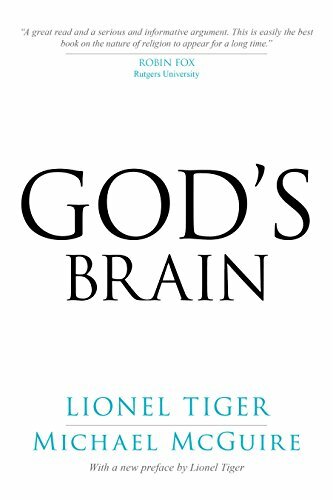 While the frequent comparisons of the human brain to the primate brain may not please religious believers, the authors use these comparisons to bolster the concept that the need for religion is biologically determined within our brains. Religious dogma falls outside of scientific inquiry and therefore cannot be proven or disproven. Belief is its own authority and thereby cannot be challenged. True believers are often a chosen people, and this its practice will lead to salvation when lives of nonbelievers will not. Overall, this book promotes an interesting idea, which may have appeal for nonbelievers to understand their religious counterparts. The concept that over time the brains of human beings consistently need to deal with stress and minimize its impact makes good sense. To the extent that the common hallmarks of religion decrease stress, it would serve a useful function for mental peace and comfort. At times the book has a choppiness that is often seen in a text written by two authors. Chapter 10, entitled “And What’s Your Brainsoothe Score?” seems out of context within the rest of the text. If a reader is interested in trying to understand religion from a relatively unbiased viewpoint, this book will fill that need.